In a last-minute scramble, BT decided to add-in the 10 “winners” of the BT Race to Infinity Campaign that BT Retail (another part of BT) ran last year. One might have thought that those who came 11th, 12th, 13th …..or even those in the top 50 in the BT Race to Infinity Campaign might have had a look-in. But no, our neighbouring Parish, Brenchley, that came number 11 was not on the list. Nor were we (at number 45) out of the so-called “eligible” 2,495 exchanges that the Race to Infinity Campaign were considering. Interestingly again, none of the exchanges announced were in Kent. Lindfield (which won our “Battle for the Downs”) is the only recognisable exchange on the list. But the winner for the Battle of the North Downs is nowhere to be seen. We played by the rules for the BT Race to Infinity Campaign. But clearly there are other rules to this game. What is the Game Openreach? And how can we play (and have a chance of winning)? Or should we go and sell Kent to France Telecom/Orange? Or even the Dutch? After all, they often feel closer than London! 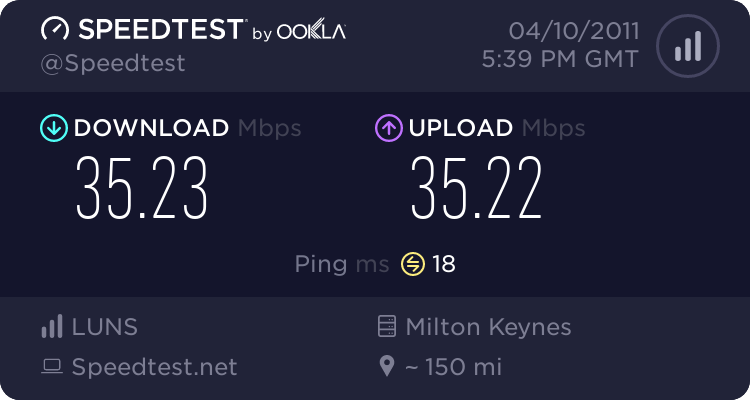 http://www.speedtest.net/result/1245724776.png – forget the sad old BT cabinet offering with only ‘upto’ (and we all know what that means) 10 meg upload and the people more than a few metres away from the cabinet on 5 meg download, just ask your council to get you a digital village pump and you can have 35 meg both ways like us. Cabinets are obsolete before they are even installed. Don’t wish for Infinity. Take Beyond. Next post: Our Bid has Gone In to KCC!